We want to use the latest technology to help you Reduce Re-use & Recycle better. We are excited to know that we are helping you do your bit too, and we thought the best way to do that is with an App. An App that has detailed local information to suit you. A simple easy to use tool for the householder, accessible 24:7/365 the App is designed for the householder to inform and advise on Reduce, Re-use and Recycling in your council area. 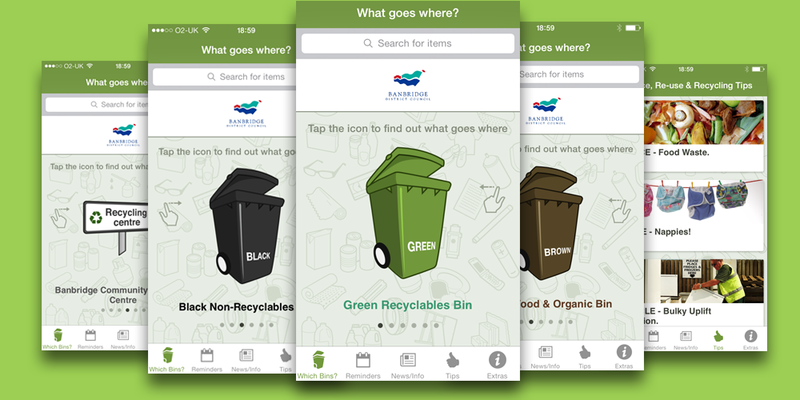 The Bin-Ovation App allows your local council to keep you up to date with important stuff like automatically populated bin collection & holiday reminders, collection date changes, new recycling initiatives etc. At Bin-Ovation we are all about clarity! Complete clarity in fact about what waste goes into which bin in your street. The founders, husband & wife duo Michael & Deborah Brady like a lot of people have a young family and overflowing bins, and more annoyingly bins not being collected because of contamination!! They decided to learn more about recycling in their area so they could actually close the lid on their general waste bins! So they started to do a little digging and discovered all councils recycle very differently. That’s because they are in contract with recycling companies who can only process waste items that suit their equipment. That was news to the Bradys! They then realised that there was not enough detailed information from councils beyond the limited amount supplied by Councils on a printed leaflet or web page. The Bin-Ovation App is available for free on the Apple App store or Google Play. You can download by clicking on the links below. We hope it works for you as well as we expect and remember if your council is not listed you can submit a request by completing the submission form. Alternatively you can contact your local council directly.